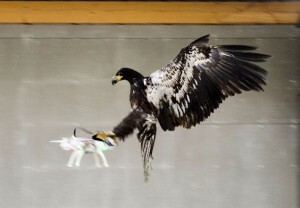 The Dutch police is testing the usage of eagles against drones. An eagle is seen gliding straight toward a drone before clutching it and dragging it to the ground in Rotterdam, Netherlands, January 29, 2016, in this handout photo released by the Netherlands police to Reuters on February 1, 2016. Dutch police are testing eagles as a way to confiscate drones.